I’m currently working on providing some data for domestic properties, mainly for the purpose of making the process of getting a buildings insurance quote easier. One of the parameters the insurance industry is interested in is the age of a home. 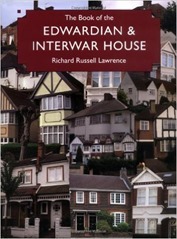 And so I came to The Book of the Edwardian & Interwar House by Richard Russell Lawrence. I picked the book up partly out of curiosity but I also hoped to pick up some ideas as to how I might date a house based on the information to hand. The book starts with some general comments about the period and what had gone before, leading to a discussion of Edwardian architecture. This is followed by a similar discussion of interwar architecture. The book finishes with a whole load of short chapters on individual elements of the home, bricks, tiles, lighting, wireless and telephone and so forth. As well as simple domestic architecture there is some discussion of high end homes of the period. The second half of the 19th century saw the expansion of British cities, driven by industrialisation and enabled by the growing railway system and, for the capital, the London Underground. This led to the building of an awful lot of terraced houses at high densities, generally to be rented to workers. The 1877 Model Bye-laws Act and the 1878 Building Act set some requirements on how houses could be built in terms of their size, distance from facing houses and sanitary facilities. This situation continued into the beginning of the 20th century, with a growing middle class looking for better homes than the terraces offered. The First World War brought house building to a complete stop, after the war there was a housing shortage of something like 850000 properties and a fear in government that there would be fighting on the streets if “Homes Fit for Heroes” were not supplied. The Interwar period saw a huge increase in home ownership, the building of 4 million homes (the majority semi-detached) and the first council houses. Public housing was built following the specifications of the Tudor Walters Report (1918), which specified a minimum size of 760 square feet, a maximum density of 12 houses per acre and preferred wider houses, semi-detached or in short terraces. Private housing sought to differentiate in stall from public housing but could scarcely offer poorer specifications. This is interesting because sizes and spacings of buildings can be determined from the Ordnance Survey’s mapping data. Earlier regulations, following the Great Fire of London, had banned the building of timber-framed houses in cities and windows had to be recessed in their openings for similar reasons. This, and details such as how bricks are laid, can give further information on building age but they are not readily amenable to automation or determinable from public data. Gross style seems to be of relatively little help when dating buildings, many Edwardian and Interwar houses were built in neo-Georgian style which as the name implies can look very Georgian. Also popular was Tudorbethan which emulated an old English style with mock, black wooden beams painted or nailed to a white exterior. Chester’s city centre is rife with an elaborate form of this style, mainly built in the Edwardian or very late Victorian period, although there are some examples of the genuine article. Internally, the period saw the evolution of the kitchen, scullery and kitchenette as new-fangled gas and electric ovens replaced old ranges. There was also a discussion as to whether buildings for workers should have a separate parlour and living room. I’m well aware that my grandparents generation would often reserve a room for “best”, which as family did not get invited into. It struck me as I read The Book that houses I would have been fairly confident were post-Second World War I now suspect are interwar. It surprised me that modest houses started to get a garage as an option as early as the 1930s, the big increase in car ownership had started before the First World War, a bit earlier than I expected. I learnt some new useful vocabulary, a “catslide” roof is one on a two storey house which terminates at the top of the first storey. A “hipped” is one that has slopes on more that two sides, rather than having gable ends (previously I’d have called this a “roof”). This is something of a coffee-table book, with lots of photographs, I found the text in the early part more readable than the long litany of descriptions of individual architectural details. I have a few ideas to try out on the dating of houses.